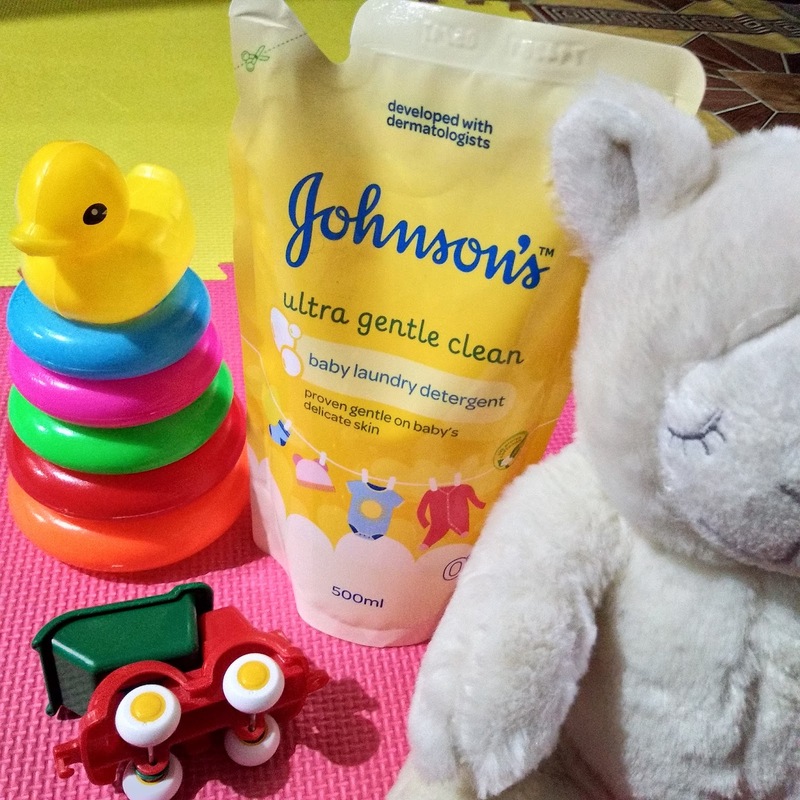 Johnson’s being a staple brand in every household recently launched a new product which will surely help moms with their babies’ needs. It’s the Johnson’s Laundry Detergent. We grew up with Johnson’s products at home and it’s only now that I saw a laundry detergent from the brand. I am grateful for they sent me these products to review. To be honest, I do not use a separate laundry detergent for my baby’s clothes now that he reached a year old. We use the same detergent in all our clothes now. 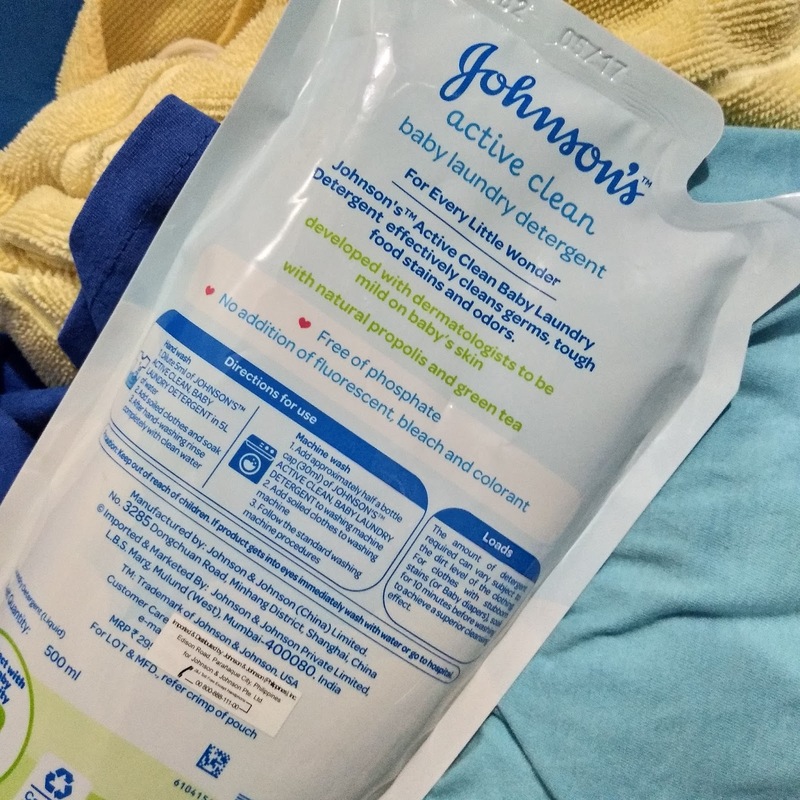 Though before, we have a different detergent for baby’s clothes because as a first-time mom, I am very careful on what product to use on him for fear that strong laundry detergents might hurt his skin. As time goes by, we followed the old ways of just using the same thing to everyone so that baby won’t be ‘maselan’ as they say. Though a part of me was honestly guilty because I just didn’t continue using his old laundry detergent because it was so difficult to purchase. We bought it online so shipping was an additional cost plus the dilemma of waiting made the whole situation unbearable. Johnson’s having their newest product would surely hit the stores like a storm. Since the brand was known and is easily available at our local market, then it’s easy for every household to purchase their baby’s laundry detergent and be free from worrying of the products’ safety. 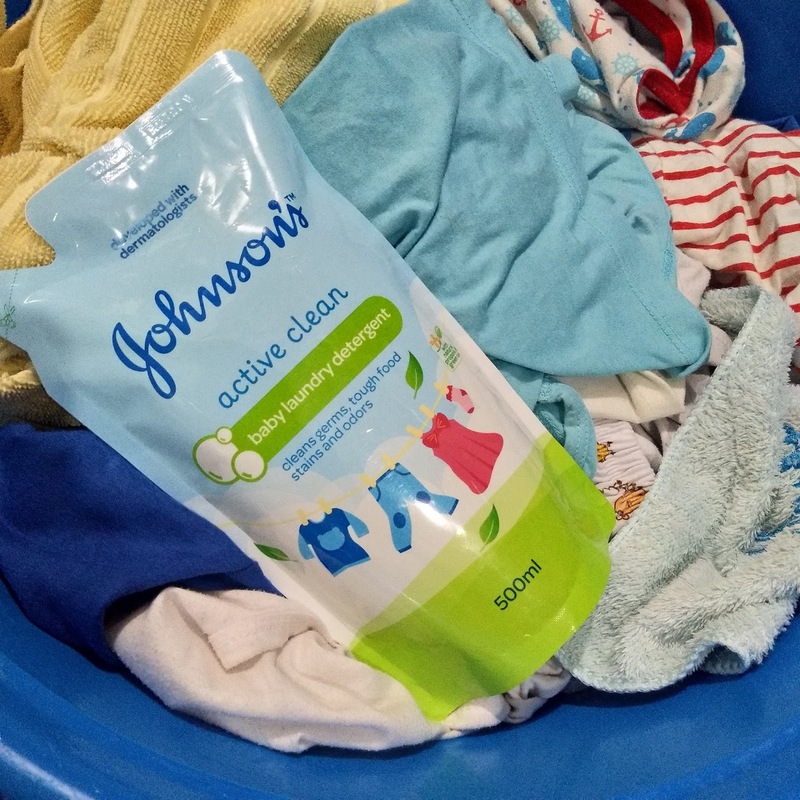 Johnson’s Laundry Detergent has two variants, the Ultra Gentle Clean and the Active Clean. The first is proven gentle on baby’s delicate skin while the latter cleans germs, tough food stains and odors. Ultra Gentle is good for 0-12 months. It rinses clean so no harsh irritants touch newborn’s delicate skin. Active Clean on the other hand effectively cleans germs and tough stains with natural propolis and green tea. I started using the first variant, the Ultra Gentle and I like how mild the scent was. We practiced separating baby’s clothes into our own so I first soak his clothes in this detergent and I even liked the effect because I think the whites became brighter, not to mention that the scent of his clothes smells nice. In our previous detergent, the clothes just doesn’t have any smell. If we wish to make it smell nice, we would put fabric conditioner on it but we prefer not to. 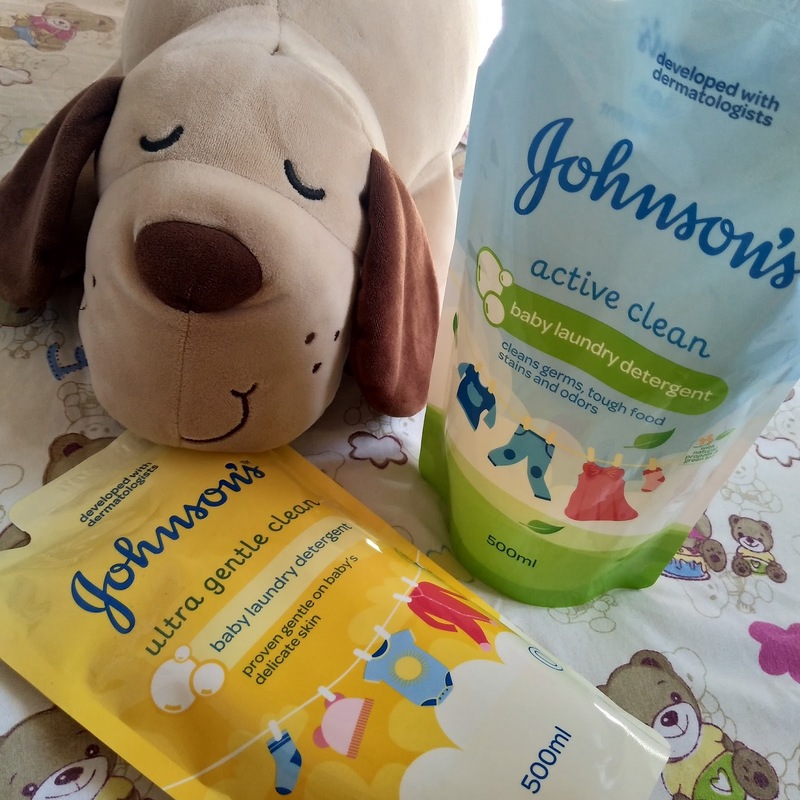 The week after using Ultra Gentle, I tried the Active Clean which is more suited for baby because he’s more than a year old now and it is recommended for his age since he’s more active and a lot busier as he walks and runs whenever he want. I also tried to soak it before washing it. It has been our practice really, especially for the whites. We just wash directly the colored ones. This one has a scent like the Philosophy perfume which is the Grace one, only a waaaay milder. I love the smell. This is the kind of smell I want for my perfume. The Ultra Gentle Clean is in baby blue color and the Active Clean can be determined as the yellow one. The product is available in 1 L and 500 ml. refill and is available at supermarkets near you!